Dehghani, I., Mostajeran, A., Asghari, G. (2011). In vitro and in vivo Production of Gingerols and Zingiberene in Ginger Plant (Zingiber officinale Roscoe). Iranian Journal of Pharmaceutical Sciences, 7(2), 117-121. Imaneh Dehghani; Akbar Mostajeran; Gholamreza Asghari. "In vitro and in vivo Production of Gingerols and Zingiberene in Ginger Plant (Zingiber officinale Roscoe)". 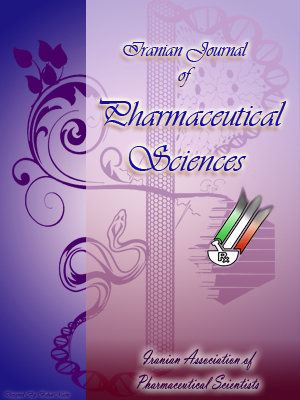 Iranian Journal of Pharmaceutical Sciences, 7, 2, 2011, 117-121. Dehghani, I., Mostajeran, A., Asghari, G. (2011). 'In vitro and in vivo Production of Gingerols and Zingiberene in Ginger Plant (Zingiber officinale Roscoe)', Iranian Journal of Pharmaceutical Sciences, 7(2), pp. 117-121. Dehghani, I., Mostajeran, A., Asghari, G. In vitro and in vivo Production of Gingerols and Zingiberene in Ginger Plant (Zingiber officinale Roscoe). Iranian Journal of Pharmaceutical Sciences, 2011; 7(2): 117-121. 1Plant Science Division, Biology Department, University of Isfahan, Isfahan, I.R.Iran. 2Isfahan Pharmaceutical Sciences Research Center, School of Pharmacy and Pharmaceutical Sciences, Isfahan University of Medical Sciences, Isfahan, I.R.Iran. Ginger plant, Zingiber officinale Roscoe, is an important tropical plant used as spices and well known for its medicinal properties. It has a pungent and aromatic rhizome rich of zingiberen and gingerols. Many secondary metabolites are known to accumulate in the plant cell culture systems. So, in this research, gingerols and zingiberene production of callus cultures were compared with regenerated plant in vitro and glasshouse cultivated ginger in vivo. The experiment was conducted in a randomized treatment design with 4 replicates. Ginger rhizomes were imported from china and were cultured in dark at 28±2 °C for 30 days for sprouting and then were cut to small pieces (2-3 cm) and sterilized, and then the rhizomes were cut into 5 mm sized pieces. Bud explants were inoculated on different sterile medium at 25±2 °C under 16 L/8D photoperiod for 2 months. For in vivo culture, the ginger rhizome’s surface was sterilized by using 1 g of l-1 of benomyle fungicide solution then was cut into small unique pieces and kept in perlite in control condition for 2 weeks for germination. Then unique sprouting seedlings were transferred to hydroponic system including Hoagland’s solution for 3 months. Fresh calli, in vitro and in vivo gingers rhizomes were used for extraction with dichloromethane and analyzed by TLC. No gingerols and zingiberene spots on calli plates were detected, but in vitro and in vivo ginger rhizomes produced gingerols and zingiberene. Therefore, callus culture of ginger is proposed for rapid proliferation of plant cells. Ginger plant, Zingiber officinale Roscoe, is an important medicinal horticultural crop in South East Asia and has a pungent, aromatic rhizome that is rich in secondary metabolites such as oleoresin, phenolic derivates, zingiberene and gingerols . Ginger has been traditionally used for treatment of headaches, nausea, colds , arthritis, rheumatism, muscular discomfort , and inflammation . Ginger therapeutic effects such as anti-inflammatory activities and moderate pungency have been attributed to the mixture of gingerol derivatives in oleoresins . Recently, the production of secondary metabolites using plant cell and organ culture has been considered as a major research area. Micropropagation , organ culture , somatic embryogenesis , organogenesis , protoplast culture , and germplasm preservation  of ginger have been reported. Many compounds are known to accumulate in plant cell culture systems (in vitro), and their concentrations were equal to or higher than that of the plant (in vivo) . Dornenburg and Knorr (1995) reported that cell culture have a higher rate of metabolism than intact differentiated plants because the initiation of cell growth in culture leads to a fast proliferation of the cell mass and to a condensed biosynthetic cycle . It is reported that production of gingerol and zingiberene in callus culture of Z. officinale is correlated with some sort of dif-ferentiation . Lack of information on in vitro and in vivo differentiation related to the secondary metabolite production in Zingiber officinale Rosc. was the reason for conducting this experiment. In this research, secondary metabolite (gingerols and zingiberene) production of callus culture (in vitro) and regenerated ginger has been compared with the ginger which was cultivated in greenhouse (in vivo). Ginger rhizomes were obtained from China and then kept in dark at 28±2 °C for 30 days for sprouting. The ginger rhizomes were cut into small pieces (2-3 cm) and sterilized in 2% NaClO solution with 4 drops of Tween 40 for 5 min, after tap washing and treatment with 70% ethanol for 30 sec. After a thorough wash in sterile distilled water, the rhizomes were surface sterilized with 0.2% (w/v) mercuric chloride solution enriched with few drops of 1 N HCl for 10-15 min. Following repeated washes with sterile water (4 washes, 3 min) the rhizomes were cut into 5 mm sized pieces having at least one bud. The outer sheaths covering buds were further removed . The buds as explants were inoculated on a different sterile medium with 4 replicates . The basal Murashige and Skoog (MS) medium, containing 3% sucrose and 0.7% agar, pH 5.8, supplemented with 2,4-dichloro phenoxy acetic acid (2,4-D) and Kinetin (Kn) as plant growth regulators (PGRs) were used as the medium for different treatments (Table1). The buds of rhizomes in the medium were incubated for 2 months at 25± 2 °C under 16 L/8D photoperiod for callus establishment. The medium with 1 and 0.2 mg.l-1 of 2,4-D and Kn, respectively (M4), was used to obtain the highest percentage of callus induction. Each treatment resulted in callus formation accounted as positive results on callus induction. Then, the callus mass was also sub-cultured to hormone free medium M1 for 3 months in order to obtain shoot development and leaf emergence that lead to ginger regeneration . The ginger rhizome’s surface was sterilized using 1 g/l of benomyle fungicide solution then cut into small pieces in such a way that each piece contained one vegetative bud. The rhizomes were planted in control condition in glasshouse (30±5 °C, 55±5% RH and 16 L/8D photoperiod) in small pots filled with perlite for germination. After 2 weeks, the unique sprouting seedlings were transferred to hydroponic system including Hoagland’s solution for 3 months . Fresh calli, in vitro and in vivo ginger's rhizomes were cut into smaller pieces and macerated with dichloromethane (5 ml), at room temperature, then shaked for 20 min., filtered, and concentrated under nitrogen gas to give at least 1 ml of the extract, dehydrated by anhydrous sodium sulfate and chro-matographed on a pre-coated TLC silica gel plate (silica gel G 06o F254 plates). The TLC plates were put inside the development tank for the solvent to run up. N-hexane:diethyl ether (40:60 v/v) was used as developing solvent system. Then the plates were taken out before the solvent front reach to the top. The dried plates were then visualized by heating at 110 °C after spraying the reagent. The reagent used was sulfuric acid and vanillin. The individual zones were detected and identified in comparison with standards and the relevant literatures . Table 1. The treatments consisted of Murashige and Skoog (MS)medium and supplements for callus induction. Table 2. Percentage of callus induced in different mediums. The results indicated that different PGRs treatment has different effects on callus establishment. Using 0.2 mg/l of Kn had the lowest effect with 30%, but 1 mg of 2,4-D caused production of 50% of callus. The best results were obtained when the combination of 2,4-D and Kn were used. In this case 70% callus was produced (Table 2). TLC analysis showed several spots with different Rf values in which gingerols and zingiberene spots were identified. No gingerols and zingiberene spots on calli was detected (Table 3), but two very apparent spots on plates related to in vitro regenerated and in vivo greenhouse cultivated ginger rhizomes were observed. Gingerols, was revealed as a light violet spots which was equal to standard spot at Rf 0.3 and zingiberene as a dark purple spot at Rf 0.9. Indeed, results showed no more spots in regenerated in vitro ginger compare to in vivo. Despite positive effect of high concentration of 2,4-D on cell proliferation rate and consequently callus induction (70%) at M4 medium (Table1), no gingerols and zingiberene was detected in callus samples. Petiard et al. (1985) had reported that a number of physical and chemical factors could influence secondary metabolism in plant cell culture . They concluded that the concentration of plant growth regulating hormones (PGRs) such as auxin (e.i 2,4-D) increases the cell growth, and higher concentrations of these hormones are deleterious to secondary metabolite production . Similar results were reported by Ma and Gang (2006) on secondary metabolites formation in callus of ginger . Indeed, the sites of secondary compounds synthesis and storage in plant cells often are located in individual or separated compartments such as highly specialized structures containing secretory and accumulatory elements and oil glands. In undifferentiated callus cultures, these accumulation sites are missing and probably due to the sites missing in calli, very low or no detectable yields of the secondary components were obtained . According to Zarate and Yeoman (1994), the number of pigmented cells (cells containing the essential oils) is higher in mature rhizomes than in immature ones. Furthermore, they observed that there is a reasonable correlation between the number of pigmented cells and gingerols accumulation sites in the mature and immature rhizomes . The finding of Zarate and Yeoman (1994) may support our results on no production of gingerols and zingibnerene in callus culture of ginger due to lack of morphological differentiation. Table 3. Gingerols and zingiberene production on calli, in vitro regenerated, and in vivo mature ginger plant. The amount and composition of secondary metabolites production in plant cells have been shown to be variable , and they often change due to physiological conditions . Also, alterations in the environmental factors such as nutrient levels, light and temperature may affect the amount and composition of secondary metabolites . Funk and Brodelius (1994) reported that higher amounts of N-sources in MS medium (in vitro) than in Hoagland's Solution (in vivo) play an important role in secondary products accumulation in ginger cells as well as in Vanilla planifolia . Anasori and Asghari (2008) also reported that the presence of light is necessary for the gingerols and zingiberene production in differentiated Z. officinale . So, in vitro and in vivo different physiological conditions such as nutrient solution components, light, temperature, pH, O2 and CO2 uptake would caused differences between two environments and may influence gingerols and zingiberene production. However, no variation in composition of these two secondary metabolites was observed when different conditions were used in differ-entiation of Z. officinale in this experiment. It seems that in vitro conditions have not been effective on gingerols and zingiberene production resulting from variation of medium nutrients or morphological differentiation. Authors would like to thank University of Isfahan and Isfahan University of Medical Sciences for supporting this work. Bhagyalakshmi N, Singh NS. Meristem culture and micropropagation of a variety of ginger (Zingiber officinale Rosc.) with a high yield of oleoresin. J Hortic Sci 1988; 63: 321-7. Grant KL, Lutz RB. Alternative therapies: ginger.Am J Health Syst Pharm 2000; 57: 945-7. Blumenthal M, Werner BR. The complete German Commission E monographs: therapeutic guide to herbal medicines. Austin, Tex. : American Botanical Council; Boston, MA. : Integrative Medicine Communications. 1999. Kiuchi F, Iwakami S, Shibuya M, Hanaoka F, Sankawa U. Inhibitors of prostaglandin biosynthesis from ginger. Chem Pharm Bull 1982; 30: 754-7. Mustafa T, Srivastava KC, Jensen KB. Drug development report: 9. pharmacology of ginger,Zingiber officinale. J Drug Dev 1993; 6: 25-39. Hosoki T, Sagawa Y. Clonal propagation of ginger (Zingiber officinale Rosc.) through tissue culture. Hort Sci 1977; 12: 451-2. Sharma TR, Singh BM. High-frequency in vitro multiplication of disease-free Zingiber officinale Rosco. Plant Cell Rep 1997; 17: 68-72. Kackar A, Bhat SR, Chandle KPS, Malik SK. Plant regeneration via somatic embrogenesis in ginger. Plant Cell Tissue Organ Cult 1993; 32: 289-92. Babu KN, Samsudeen K, Ravindran PN. Direct regeneration of plantlets from immature inflorescence of ginger (Zingiber officinale Rosc.) by tissue culture. J Spices Aromat Crops 1992; 1: 43-8. Geetha SP, Babu KN, Rema J. Isolation of protoplasts from cardamom (Elettaria cardamomum Maton.) and ginger (Zingiber officinale Rosc.). J Spices Aromat Crops 2000; 9: 23-30. Dekker AJ, Rao AN, Gob CJ. In vitro storage of multiple shoot cultures of ginger at ambient temperatures of 24-29 ْC. Sci Hort 1991; 47: 157-67. Werrmann U, Knorr D. Conversion of menthyl acetate or neomenthyl acetate to menthol or neomenthol by suspension cultures of Mentha canadensis and Mentha piperita. J Agric Food Chem1993; 41: 517-20. Dornenburg H, Knorr D. Strategies for the improvement of secondary metabolite production in plant cell cultures. Enzym Microb Technol 1995; 17: 674-84. Anasori P, Asghari G. Effects of light and differ-entiation on gingerol and zingiberene production in callus culture of Zingiber officinale Rosc. Res Pharm Sci 2008; 3: 59-63. Chirangini P, Sharma GJ. In vitro propagation and microrhizome induction in Zingiber cassumunar (Roxb.) an antioxidant-rich medicinal plant. J Food Agricul Environ 2005; 3: 139-42. Guo Y, Zhang Zh. Establishment and plant regeneration of somatic embryogenic cell suspension cultures of the Zingiber officinale Rosc. Scientia Horticulturae 2005; 107: 90-6. Guo Y, Bai J, Zhang Zh. Plant regeneration from embryogenic suspension-derived protoplasts of ginger (Zingiber officinale Rosc.). Plant Cell Tissue Organ Cult 2007; 89: 151-7. Dehghani I. Effect of salinity stress on growth rate (dry weight) and proline content in Zingiber officinale Roscoe plant. M.Sc. Thesis. Biology Department, University of Isfahan. 2008. Wagner H, Bladt S, Zgainski EM. Plant drug analysis. New York, Springer-Verlag; 1984. Petiard V, Baubault C, Bariaud A, Hutin M, and Courtois D. Studies variability of plant tissue cultures for alkaloid production in Catharanthus roseus and Papaver somniferum callus cultures. In: Primary and secondary metabolism of plant cell cultures (Neumann KH, Barz W, and Reinhard E, eds. ).Springer-Verlage, New York, 1985; pp. 133-42. Ma X, Gang DR. Metabolic profiling of in vitro micripropagated and conventionally greenhouse grown ginger (Zingiber officinale).Phytochemistry 2006; 67: 1673-85. Zarate R, Yeoman MM. Studies of the cellular localization of the phenolic pungent principle of ginger, Zingiber officinale Roscoe. New Phytol 1994; 126: 295-300. Parr AJ. Secondary products from plant cell cultures. Adv Biotechnol Proc 1988; 9: 1-34. Pfeiffer N. FDA OKs Calgen's Flavr Savr TM tomato for marketing in supermarket. U.S. Genetic Engineering News 1994; 14: 1-31. Stöckigt J. Biotransformations with cultivated plant cells. Agro Food-Industry Hi-Tech 1993; 4: 25-8. Funk C, Brodelius PE. Vanilla planifolia: In vitro biosynthesis of vanillin and other phenylpropanoid derivatives. In: Biotechnology in agriculture and forestry, vol. 26. Medicinal and aromatic plants VI(Bajaj. Y. P.S. eds.). Springer-Verlag, Berlin, 1994; pp. 377-402.